I have joined a "tat-a-long" doing LaRae's Celtic bookmark on the site of my friend from Brussels, Bidouillette. This means leaving to one side both Beatrice, (well I need to order more thread anyway) and the basic doily (which is being a bit fiddly at the moment ) and the snowflake project from Jon's book. This is the latest, "twirly" with the ends not hidden. For the tat-a-long I will write in (not very good ) french, to be more accessible to my new french friends, this means the posts will be mostly photos! 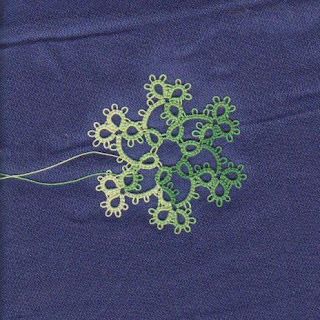 Very pretty tatting. You've been busy! Challenge indeed! This is a big project and you have gotten so far already! It is looking fantastic! I like the idea of you posting in French as well. I am currently brushing up on my very rusty French skills. Oh, so pretty! 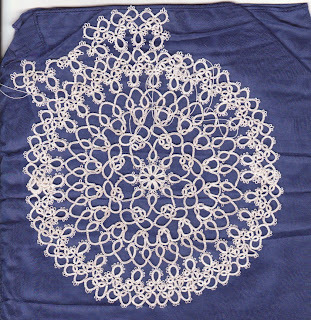 I really need to start tatting some snowflakes, but I'm having so much fun working on Iris's doilies! Bravo pour ces très jolies réalisations. Tu as beaucoup travaillé, et bien! Thank you, et Elisa, merci aussi. Je ne suis pas de tout creative comme toi, je regard avec emerveillement tous tes creations! Mon travaille est toujours un dessin de quelqu'un d'autre. Very nice! What a lot of work. You have been tatting a LOT!